The Three Cent silver coin, sometimes called the "trime", was first released in 1851. It was created to facilitate purchase of the three cent postage stamp, while relieving demand for the cumbersome Large Cent. The Three Cent coins of 1851-53 contained 75% silver and were produced in relatively large numbers. In 1854, the silver content of the trime was increased to 90%. The year 1854 also coincided with a dramatic decrease in mintage quantities, as demand fell. From 1863 until their demise in 1873, production dropped further. Only tiny numbers of business strike Three Cent silvers were produced (ranging from 1,000 to 21,000 annually), and most of them were never released and melted by the Treasury Department years later. 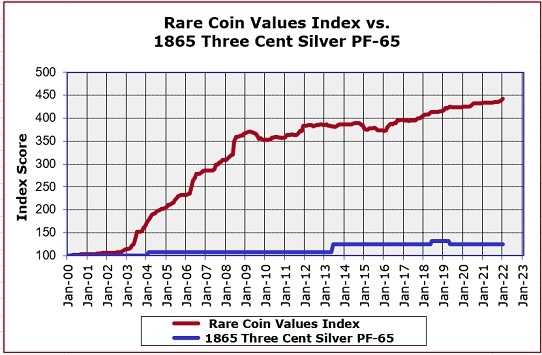 The blue line charts the percent increase, or rather, the lack of increase of the 1865 Three Cent Silver coin in PF-65 condition, since Year 2000. The 1865 Three Cent Silver is in fact rare, but collectors do not crave the coin as they do other key dates. Nonetheless, we included it in our Rare Coin Values Index, because we wanted a representative from the Three Cent Sivler series included in the Index. The Index measures the percent change since Year 2000 of a cross-sectional group of 87 rare US coins. The objective of the Index is to get a feel for the strength and direction of the overall rare US coin market. The Index is updated once a month.